Studio apartments are ideal for saving on rental costs but one of the drawbacks is that there’s no separation of space between the living area and the bedroom. This could make you feel like your bed is constantly beckoning for you to stop and rest – or that rest is out of the question because the desk is staring at you all night. 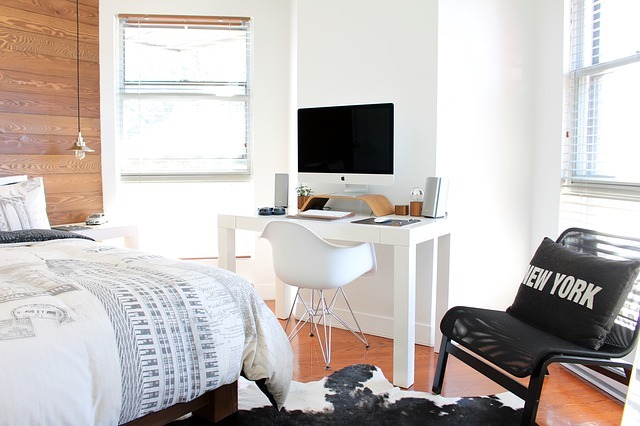 With a few easy adjustments, you can transform your studio into a workable one bedroom and get the best of both worlds – efficient space and cost savings! First, decide where you want to put your bed. Ideally, it’s easier if the bed is in its own corner so you can section it off for privacy and utilize the rest of the space for your living area. Take note of the lighting, the noise level, and space and set up your bed in the area that is most conducive to a good night’s sleep. Once you decide where you want your bed, you can decide how you want to section it off. Bookcases are a great option for sectioning off an area of your studio apartment because they’re versatile in shapes and sizes and are a solution to the obvious need for storage. You can mix and match items on the shelves from functional things like an alarm clock and blankets to decorative pieces like picture frames, vases, and collectibles. Second-hand stores are a great resource for bookcases which you can always paint to match your color scheme. Room dividers add an accent of style and are easy to maneuver as you move things around to attain the balance you want between your living area and bedroom. Wayfair and RoomDividers.com have plenty of styles to complement your décor. House plants make a great room divider and add a Zen, natural quality to the space. Check out these ideas from Pinterest. Or, you can go rogue and make your bed the focal point. You don’t have to hide your bed to separate the space. Try placing your bed on a platform and utilize the vertical space in the room – working upward instead of outward. Leave enough room for a small end table and a lamp. You can also create a canopy bed by draping fabric from the ceiling to the floor at the four corners of your bed for a throne, royal-like effect. For the living area, decorate it like you would any living room, utilizing as much as you can of the leftover space. Measure the areas where you want your couch and other furniture. You want it snug, but not overcrowded. There should be room to comfortably move around. Nothing says cramped like stubbing your toe on the furniture. Create a conversational space with an accent chair, some oversized throw pillows, and a small coffee table. Accent the room with a rug that ties the living area together and a large mirror to create the illusion of more space. Consider investing in furniture that has dual uses including ottomans with storage areas and coffee tables with drawers. What are some of your ideas for maximizing space in a studio apartment? Share them with us at #LifeatWeidner.